If you are looking to sell on Amazon, you would have to take into account the different seller fees to ensure you aren’t in the red. Sure it can take a while to understand the most complex fees calculation that Amazon has, but if you know the different seller fees, you won’t have to worry. 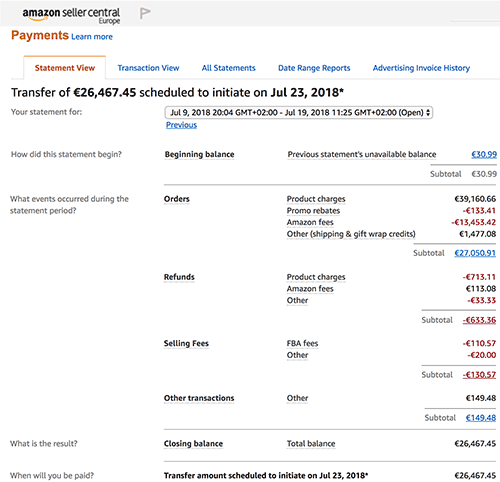 If you are an amazon seller and download a payments report you will find 36 differents fees or more like A-to-z Guarantee Refund ItemFees RefundCommission, A-to-z Guarantee Refund Item Price Main Price, Chargeback Refund ItemFees Refund Commission, Chargeback Refund Item Price Principal, Lightning Deal Fee Lightning Deal Fee Lightning DealFee, Lightning Deal Fee Lightning Deal Fee Lightning Deal Fee Special, Order Item Fees Commission, Order Item Fees Cross-Border Fulfillment Fee, Order Item Fees FBA Per Unit Fulfillment Fee, Order ItemFees FBAWeight Based Fee, Order Item Fees Giftwrap Chargeback, Order Item Fees Giftwrap Commission, Order Item Fees Shipping Chargeback, Order Item Fees ShippingHB, Order Item Fees Variable Closing Fee, Order Promotion Main price, Order Promotion Shipping, Order Shipment Fees FBA transportation fee, other transaction ItemFees FBA Customer Return Per Unit Fee, BalanceAdjustment, BuyerRecharge, Current Reserve Amount, Disposal Complete, FBA Inbound Transportation Fee, FBA Inbound Transportation Program Fee, Non Subscription Fee Adj, Removal Complete, Storage Fee, Storage Renewal Billing, Subscription Fee, Refund Item Fees Refund Commission, Refund ItemPrice GiftWrap, Refund Item Price Goodwill, Refund ItemPrice Principal, Refund Item Price ReturnShipping, Refund Item Price Shipping. We will take a look at all seller fees you may have to pay. As a seller, you would receive your Amazon Payouts every two weeks. However, businesses which have an operating cost and supplier bills, receive a bi-monthly Amazon payout. Amazon has different codes for each of the seller fees. Here is a look at all the seller fees you may come across as an Amazon seller, and what they mean. The A to Z Guarantee Refund fees applies to any problems with the order, like the shipment getting delayed, where Amazon issues a refund to the customer and charges the same to you. Refund Commission – The expenses for the refund are debited from seller account when refunding a customer. Main price- The price of the item refunded to the buyer after filing a claim. If the buyer makes a chargeback on his payment method, Amazon will charge you for it. Here is what can happen. Refund Commission – The charges deducted by Amazon while refunding a customer. Main Price- The refund of the principal amount to the buyer for an item in case of a chargeback. Should you decide to feature your product on the Amazon Deals page, you will need to pay a fixed lightning deals fee. Lightning Deal Fee Special – Apart from the usual lighting deal fee charges for featuring your product on Amazon Deals page, you will need to pay more when higher traffic is expected. Featuring your product then could, in turn, lead to higher sales for you. There can be a different order related fees, according to the situation. Here are some of the common order related fees. Commission– It’s the commission charged by Amazon for the sale of products on Amazon. Cross-Border Fulfillment Fee- The fees charged for orders to any of Amazon’s other markets, apart from your local home market. FBA Per Unit Fulfillment Fee- It’s the FBA fulfilment fees charged by Amazon per unit of product. FBA Weight Based Fee- Denotes the fulfilment fees charged to you based on the weight of the shipped item. Gift wrap Chargeback- The reversal of gift wrapping fees paid to the seller by Amazon FBA. 4.6. Gift wrap Commission– The fee charged for gift wrapping by Amazon. 4.7. Shipping Chargeback– It is charged against Amazon fulfilled orders and equals to the amount charged to the customer. On Amazon orders for Prime members, Amazon still pays the shipping charges somewhere and has to mark it in accounting as such. Sometimes the customer does and this is what you are seeing: what the customer paid Amazon during the entire order. But since you’re paying the weight fee and other fees for FBA, you don’t get that credit. Amazon needs to cancel it out from your payment so they do what is called a shipping chargeback. There is a bit of anger to this as Amazon is essentially “double dipping” on shipping when it comes to sales because you can sell 100 orders for the same product and 50 will have no shipping charges and the other 50 Amazon will have Amazon rolling in shipping cash but you will always see the same amount for all of them. 4.8. Shipping HB- Fees charged by Amazon for handling and shipping of products. 4.9. Variable Closing Fee- Charges per item applied on media products like video games. 5.1. Main price– The amount of promotional discount charged on the principal of the product. 5.2. Shipping– The amount of promotional discount on your product is charged back from your account. These include fees charged for shipment of products. 6.1 FBA transportation fee– Charges incurred by Amazon per order towards FBA Multi-Channel Fulfillment. You have to pay these charges related to refund of products to the customer. 7.1. Refund Commission- Charges incurred for refunding the product to the customer. 7.2. Gift wrap– Refund of gift wrapping fees charged by you. 7.3. Goodwill– Sometimes, Amazon reimburses you for any refund costs related refund to the customer. The amount is generally credited back within 45 days, and you don’t have to pay for the refund costs. 7.4. Principal– Refund of the principal amount of the product to the customer. 7.5. Return Shipping– Refund of return shipping fees to the customer which is charged from your account. 7.6. Shipping– It’s the refund of shipping charges to customer debited from your account. When can you get a credit of a refund? While somewhat unlikely, you might also get credit from Amazon if a customer tries to return an item that is not eligible for a full refund. In that case, the amount the customer pays as the restocking fee gets added to your account. You can also get a refund credit if your product gets lost or damaged in the Amazon warehouse during transit. There is situations where you can request a credit but we will cover in another article. 8.1. FBA Customer Return Per Unit Fee– Fees for products returned by the customer under free shipping. 8.2. Balance Adjustment- Adjustments for overpayment. Review settlement report for more details on the specific transaction. 8.3. Buyer Recharge– Amount charged from a customer for the refunded product. 8.4. Current Reserve Amount– Standard reserve amount debited for 6 months in case of new sellers to protect buyers. 8.5. Disposal Complete– Fees applicable when you dispose any item from FBA inventory. 8.6. FBA Inbound Transportation Fee– Fees charged for shipping your item to FBA. 8.7. FBA Inbound Transportation Program Fee– Chargeable in case of Amazon accounts for shipping products to fulfilment centers through UPS service. 8.8. Non-Subscription Fee Adjustment- Chargeback of double payments made by Amazon from your account. 8.9. Removal Complete– Fees for removing your products from FBA inventory. 8.10. Storage Fee-Storage fees for your products which have been sitting in FBA center for more than 365 days. 8.11. Storage Renewal Billing- Fees for renewing your product storage in FBA centers. 8.12. Subscription Fee– Amount of fees for your preferred selling plan on Amazon. You can go for either professional or individual selling plan. There are a lot of Amazon seller transactions. The more you engage yourself in the Amazon online selling business, you will realize how significant it is to manage your business operations, starting with storing, packaging, shipping, uploading to selling. There is also a Goodwill customer refund, where Amazon refunds a payment for an item to the customer on their own, without you having to pay for it. If you found a fee not listed here let me know commenting this article. This entry was posted in Amazon, Fulfillment Spain and tagged amazon seller fees, amazon transactions fees.